No pond is complete without lights. They transform your garden and make the pond so much more interesting and attractive. The range of lights carried at Causeway Koi means that there is something for every pond. Speak to us if you're not sure what to go for. The PondoFog creates a stunning effect and produces air for animals and plants in the pond! For use above and below water! Beautiful set of 3 stainless steel garden lights with acrylic cylinder bulb housing. 10W halogen bulbs, 36W low voltage transformer (weatherproof). 15m extension cable. Cable length: 2m from plug to transformer, 3m of cable from each light back to transformer. Stylish set of 3 stainless steel garden lights with frosted acrylic bulb housing. 10W halogen bulbs, 36W low voltage transformer (weatherproof). 15m extension cable. The set consists of three power LED lights in premium quality, that also are impressive through their attractive design with high-quality stainless steel trim. Due to their compact design the spotlights can be perfectly integrated in a wide variety of environments. An addition to the proven cold-white version, these spotlights are the warm-white version. Easy to integrate in garden and pond design thanks to the small dimensions. Ideal for illumination of fountains, ponds, and pond landscapes, as well as garden and terrace. 3-unit series circuit, incl. 12V safety transformer. 3 + 2 year guarantee. 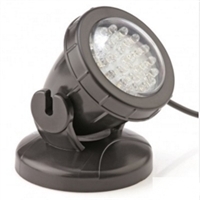 12V pond light suitable for garden illumination or under-water installation. 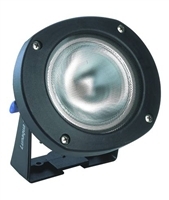 Powerful 35W halogen light suitable for bigger ponds. Comes complete with transformer.